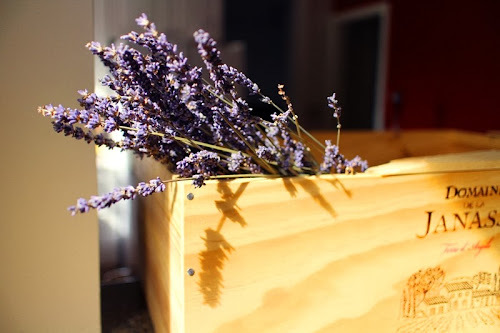 Sweet Inspired Home: Lavender harvest time! 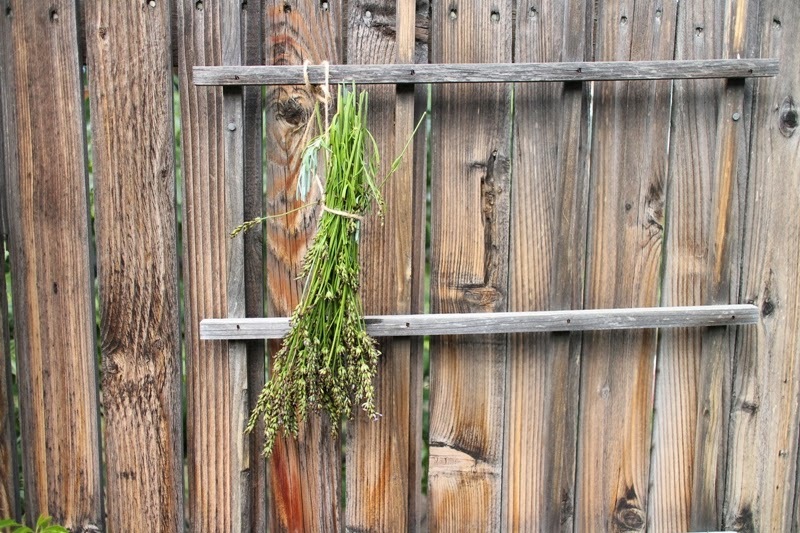 Taking a cue from some of my blog friends, I saw now was the time to harvest my lavender! This past spring I planted eight lavender plants and over the course of the summer four of them died. I really can't figure out why they died. They were in the same section of the yard as the ones that survived. They were watered the same and got the same amount of sunlight. They didn't all die at once either, they each thrived then slowly died over the summer. I was able to get a small bundle from the four plants that survived and the aroma is heavenly! I read that Denver (and most of Colorado) has the perfect zoning for lavender so next year I will replace the plants that died and hope they do better! 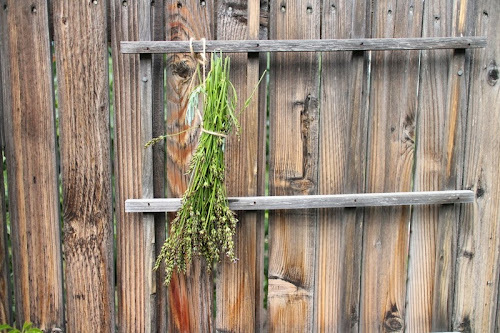 I would love any suggestions from those of you who have had luck with lavender plants. Here is the lavender all dried and pretty...just kidding. This is my stunt lavender that I already had. The lavender from my yard is still drying and not nearly this purple. I just liked the way the light was shining on them. I think we just need to keep trying until they stick! Hopefully we'll have better luck next spring! Beautiful lavender. I never plant lavender successfully, maybe to hot here. Yes lavender does like full sun & poor soil. In my garden I have what I call my lavender bed, each summer it gives me & all my summer visitors great pleasure. After each winter I think I've lost it, but after a cutting back it springs back to life.It always amazes me too how a whole row are plants, all treated in the same way I can lose some. We should realise our plants are like people...we are all different and some of us are much stronger than others and some need extra loving care. Thanks for popping by to see what I'm up to in my garden .We have lots of lizards. I have finally succeeded in growing lavender, after years of failure, and I don't know what makes the difference. It is now blooming - I must try hanging in a bunch as you show in your photo. The fragrance is always beautiful. I will keep on trying. I love lavender too much to give up! I love the smell of Lavender. So relaxing! I think I have a patch of it in my front yard. BTW - newest follower. :) lovely blog! lavender is such a great plant. smells great and looks beautiful! Well what I do know about lavender is that it does not like to be watered. It loves dry soil conditions and and full sun ~ think about the summer lavender fields in the south of France ~ sans l'eau. I was hoping to pair lavender with my roses next spring but roses love water so that will not work. Anyway, any plant that doesn't need a ton of water yet produces such amazing flowers are plants you want to have in your garden so I'd try it out again next year. Khammany, I haven't tried to grow lavender and I haven't seen it in any of the gardens in this area. The wet clay soil in this around here probably would not work out well for lavender. I am content to buy some already dried bundles when I can find them. I love the smell of lavender around the house during the winter. It helps to brighten the dreary cold days. I have my lavender drying upside down on my dining-room chandelier! But it doesn't dry purple either!!! There's a lot of lavender here in Texas, but I failed with mine a few years ago. Since then, I learned it likes to be mounded and left alone. I'm gonna try again next spring. I don't grow lavender but I sure do love it! Hope you get some good tips for growing! Love your photos! I planted some lavender this year, too. I got tons of flowers, but the stems are spindly and they flop over. Looks like we'll both be doing some lavender research for next spring. I haven't harvested mine yet, and your pretty post has reminded me to get a move-on and do it today. First, I'm going to read the other comments to see if I can learn something new about lavender. Thanks!